Today, we celebrate commencement. It is a day that we have looked forward to for many months, indeed many years for so many of us. Today we also have many guests and friends in the room and, for them, this commencement ceremony will appear somewhat indecipherable. What is Christian ministry? Why these hymns? Why this Bible from which we speak and from which these men and women are being commissioned to minister from? What do these things mean? More broadly, beyond the seminary context within the academic community, why robes? Why regalia? Why the formality of the hour? It all signals something very special, something significant, something of consequence, something of gravity. 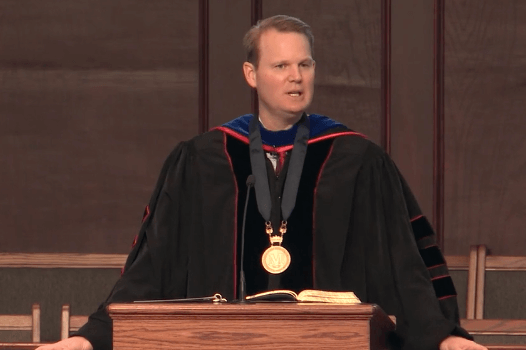 Commencement, graduation itself, is heightened when you consider our work here at Midwestern Baptist Theological Seminary and Midwestern Baptist College. This is what we give our lives to do, and in this moment, what these men and women are being commissioned unto. The context of graduation does not permit a full sermon or a full exposition of Scripture, and especially not the passage I will be reading here momentarily. But I do want to just bring seven simple words of exhortation to our graduates today. I will be speaking to them specifically but also speaking beyond them to every man and women in the room. I will be reminding ourselves anew as a seminary community what our lives are about, and seeking, again, to inform and to challenge friends and family members in the room today what life in ministry is all about as well. My aim is straightforward in the minutes that follow, to challenge our graduates anew to embrace the foolishness of gospel ministry. This passage reeks of such foolishness. The passage is one of great contrast, is it not? It is a contrast between the wisdom of the age and the wisdom of God; a contrast between the glory of God and the glory of man; a contrast between the way of the world and the way of God; a contrast the reveals two paths and two destinies; two messages that are preached and cherished, and two end results that every man and woman on this planet shall know. What does it mean to embrace the foolishness of gospel ministry? Here are seven brief words of exhortation this morning. Exhortation number one: ladies and gentlemen, is to rightly value your degree. Now, at commencement services across the country this time of year a president will stand behind a podium or lectern and say something along those lines. “You need to rightly value your degree,” and what he or she means by that typically, is that you need to rightly value your degree with a premium to it and to sense that this is special, and that this helps to define who you are and what accomplishments you will obtain in life. But I mean that you should rightly value the degree that the institution has given to you, the degree that you have earned, in a different sense. I take a detour this morning from what is typically meant. We value the degree, and I challenge you to value the degree, not for the credential that it gives you, but value the degree for what it represents. That is, a season of ministry preparation and training. I warn us all that God has used many men and women without credentials. He has passed over many men and women with them. See your time here as preparation for your ministry, but not a validation of it. You will stand, and I will stand, before a higher court, a higher judge that far outstrips the assessment of man. Your diploma that is being given today has been received previously, and others will receive it, and these are celebratory achievements, they are great accomplishments that you should look to with pride for the duration of your life in ministry. But oh, my friend, do not over assess it. As we are reminded from this passage, we are consigned to the number that is despised by the wise of this age. Exhortation number two: celebrate your accomplishment, but never forget your weakness. Don’t we see that in this passage this morning? Again, we see this contrast where Paul speaks to the believers in the church at Corinth and to us throughout the ages. We are assigned not to the wise, but to the foolish. In fact, many of you populating these front rows this morning are here graduating and you came to pursue theological education, ministry preparation, in spite of what family and friends told you, not because of it. You came not only lacking their encouragement, you came through their protest. “You are wasting your life.” “How much does a minister make anyway?” “Do you want a life of hardship?” “Do you want to spend three or four or five years getting a degree for ministry?” If you showed up here as a student with that being said to you, I have a little encouragement for you: you are going into a world where that will be said to you all the more. But it is a glorious reality to be in a defined minority that is guaranteed to be victorious. Celebrate your accomplishment, but never forget your weaknesses. Exhortation number three: I want to exhort you this morning to embrace the collision of worldviews. Be one who joins the battle, who does not dodge the battle or explain it away. We minister amidst a collision of worldviews. We see this fleshed out here amongst the ancients 2,000 years ago. This great contrast between what the Greeks were looking for who prized wisdom and philosophy and the Jews, wanting a sign. To preach Christ and him crucified, and the simple message of the Word of God in ancient times, as in modern times, puts you on a never ending, always intensifying collision course with the wisdom of the age. Embrace that. The quicker you do, the more satisfied your ministry will be and the more secure you will be in your own skin. I told some folks recently in jest, as I was reflecting with some friends and colleagues here about how we view ourselves as men and women, and how we view God, and how we interact with other people, and I was talking about the liberty of becoming increasingly comfortable in your own skin and caring less and less what people think of you. I said I will confess, when I was in my 20’s, I cared too much what people thought of me. In my 30’s, with each passing year, I cared less and less what people thought of me. Now that I am 40, I realize that no one is ever thinking about me. I say that in jest, but there is a grain of truth to that. The quicker gospel ministers, who stand on the word of God, who are willing to say antiquated things, like God created man and woman in his image with distinct roles and assignments; a willingness to preach a message that is ridiculed by so many; and a gospel message of a crucified Lord. The quicker we are willing to stand on these truths and embrace them and own them and realize that puts us right in conflict with the world; the quicker you will be secure and satisfied in your life in ministry. Exhortation number four: be committed to the foolishness of preaching. Notice in this passage, we see great contrast being outlined between the way of the world and the thinking of the world, and the way of God and the plan and wisdom of God. This is plopped right in the middle of it is this call to preach Christ crucified. Indeed, Jews ask for signs, Greeks search for wisdom, but we preach Christ crucified. Why? Because it is the foolishness of God that is wiser than men and the weakness of God that is stronger than men. I said I am committed to the foolishness of preaching, not foolish preaching or foolish ministry. There is a difference. But I think it is good for all of us, on occasion, to venture out and do a little street preaching just to be laughed at and gawked at and to be reminded anew of who we are in Christ and what we are called to do. That is, to be committed to the foolishness of preaching. It is central to the health of the church; it is central to the worship service, and it is central to every healthy ministry. It is God’s appointed means to convey his message to the world. Exhortation number five: make the cross central to your ministry. In verse 18, he says this, “The word of the cross is foolishness to those who are perishing, but to us who are being saved, it is the power of God.” And verse 23, again, he says, “We preach Christ crucified, to Jews a stumbling-block, to Gentiles, foolishness.” Be committed to a cross-centered ministry, a cross-centered pulpit, and a cross-centered life. The message to the ancients, just like in modern times, was a message that was classified as foolish. You mean God has a son and he was born of a virgin, and he lived a sinless life and he chose to die for us, to die on the cross, to receive in his body the wrath of God to satisfy the payment of our sins, be raised again, and that men and women everywhere must believe in that message and submit their lives to Jesus as Lord to be saved? That is a message that is 1,000 times true regardless of what the vast masses of humanity think of it in any given generation. We are a people of the cross; a people of the gospel. The death of Christ and the resurrection of Christ is not ancillary to our ministry. It is in the very heart of it. I say to you this morning, guests, if you are here today and you do not understand what this is about, and you think “boy the president seems awful serious and these hymns we sing seem awful dated,” and “boy everything about this seems like these people take these things a little too seriously,” it is because we do. But we do so on solid ground, because we believe with all that we are that the gospel is true, that Jesus Christ is the only way of salvation, that the men and women walking across this platform this morning are giving their lives to serving the church and there is no grander or more glorious thing to give their lives to. Exhortation number six: remain tenderized to the plight of the lost. Notice what we see in this passage in verse 18, “The word of the cross is foolishness to those who are perishing.” Starting in verse 23 he says, “We preach Christ crucified, to the Jews a stumbling-block and to the Gentiles foolishness, but to those who are the called, both Jews and Greeks, Christ the power of God and the wisdom of God. Because the foolishness of God is wiser than men, and the weakness of God is stronger than men.” This reads like a Shakespearian tragedy. People who think they are so wise, given their rejection of Christ are counted in the scales of eternity as fools. They have been measured in the scales of heaven and been found wanting. In all their learning, they have become increasingly distant from the truth. Have you ever had a gospel conversation with someone where you talk about life in Christ, you talk about how he has changed your life, and you talk about what he has done, and then they say something like, “I just don’t see it?” It pierces your heart because you know they clearly do not. I think about that every time I read this passage. Brothers and sisters, I challenge us, graduates, I challenge you, never become anesthetized to the state of the lost. Never lose your burden for the unconverted. Never become complacent to those who think they are wise but are counted as fools in the eyes of God. Finally, exhortation number seven, minister for God’s opinion, not man’s. This is how the passage comes to this great conclusion, is it not? Paul says, “Consider your calling, brethren.” We all put ourselves in this group. We have a distinguished faculty with degrees from leading institutions in the world over, but all of us would joyfully assign ourselves to this classification. I am amazed sometimes as I look out in the world of evangelicalism and see how churches are led, how ministry unfolds, and how decisions are made. Sometimes it leaves you scratching your head like, “Is this person ministering for the glory of God or for their own personal advancement?” And if you want to talk about something that throws off the magnet of the true north and that soon becomes the untrue north, the inner-motive will do it. I grew up in a wonderful middle-class Southern Baptist home in Mobile, Al. Back in those days, as a kid in the 1980’s, our house had the family room where life happened, a kitchen where life happened, and then we had a living room where life, very intentionally, never happened. It had nice furniture, nice lamps, and nice decoration. If I had a death wish, all I had to do was to go into the living room. Some of you grew up in houses like that. It was always kept perfect. We never went into it. I literally have no childhood memories of our family being in there. It was this room that was like a cocoon within a house. I remember thinking one day that this room was clearly designed for some unfathomable guest. If President Regan or Billy Graham ever stopped by our house, we were set. But the room was off-limits to everyone and everything. That room, given what it was for, was like the tail that wagged the dog in our family’s life for years. We did not go in the room so that we would make a good impression if President Reagan or Billy Graham stopped by. It is a funny story, but it is interesting to me how a decision driven by respectability or presentability can send a family, or in our case, lives and ministries on a variant trajectory. Do not have a life and a ministry and a calling that is always about being tidy and clean and respectable and meeting the approval of the neighbors and everyone feeling good about you as a nice, warm human being. Have a life and ministry and family in which you aim to please the one who matters, the Lord Jesus Christ. So, when your time is up and your service is over, and some boasting is done, you and those affected by your ministry are boasting in the Lord.